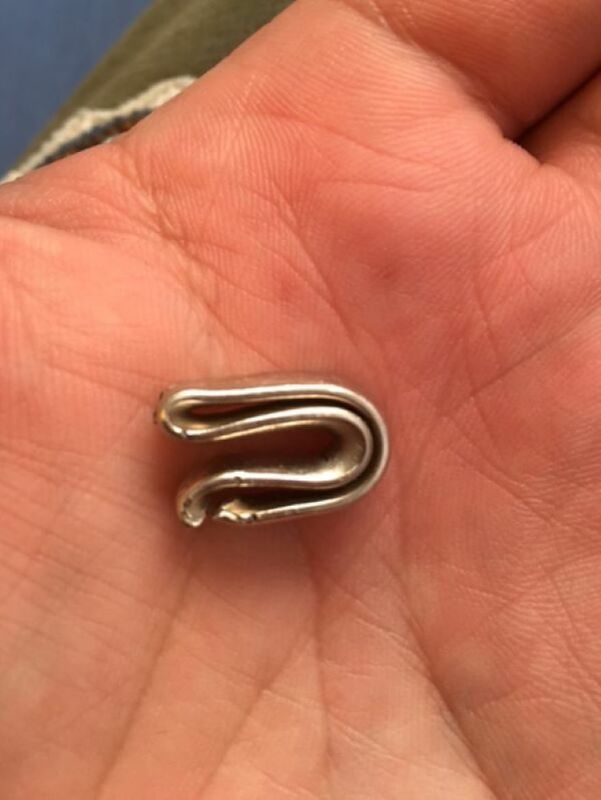 Some time ago I received a message from a man who had purposefully destroyed his wedding ring. He later regretted the act and wanted me to remake the ring using the original gold. I always welcome the chance to restore or remake such a personal item. There is something super fun about taking on a project like this. 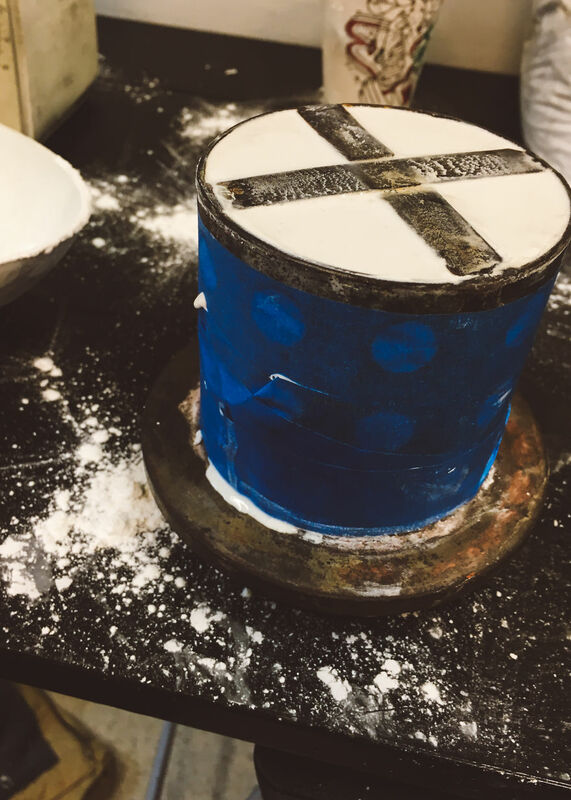 So I documented the process! BEFORE (1 of 2): A badly mangled wedding ring! A vice grip was used to inflict the damage. 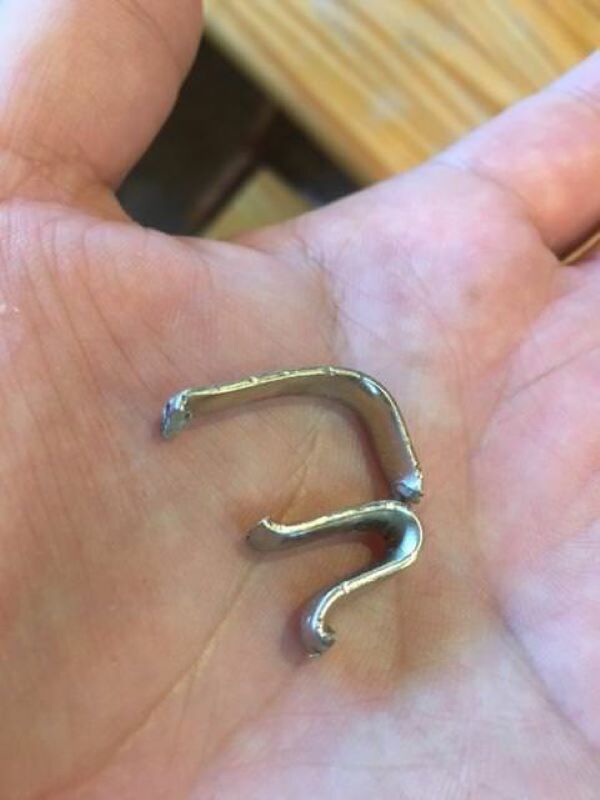 The ring was broken into 2 pieces. 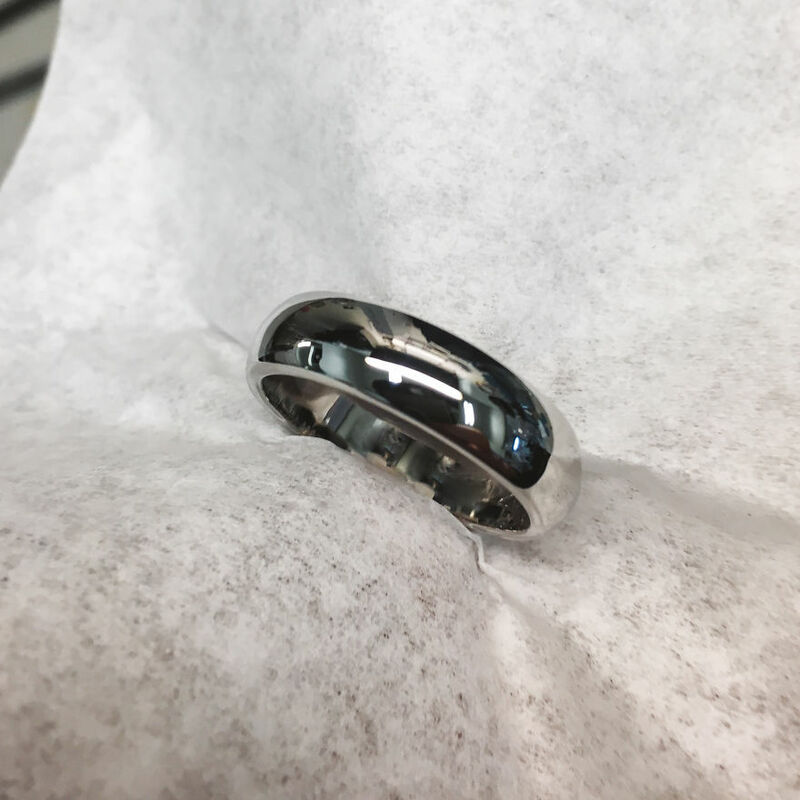 My original plan was to just melt the ring down and roll it out, then bend it to a ring shape. This could have worked but I wanted to create something seamless and perfect— something that was nearly identical to the original. So, we determined that the best course of action was to remake the ring using the existing metal. 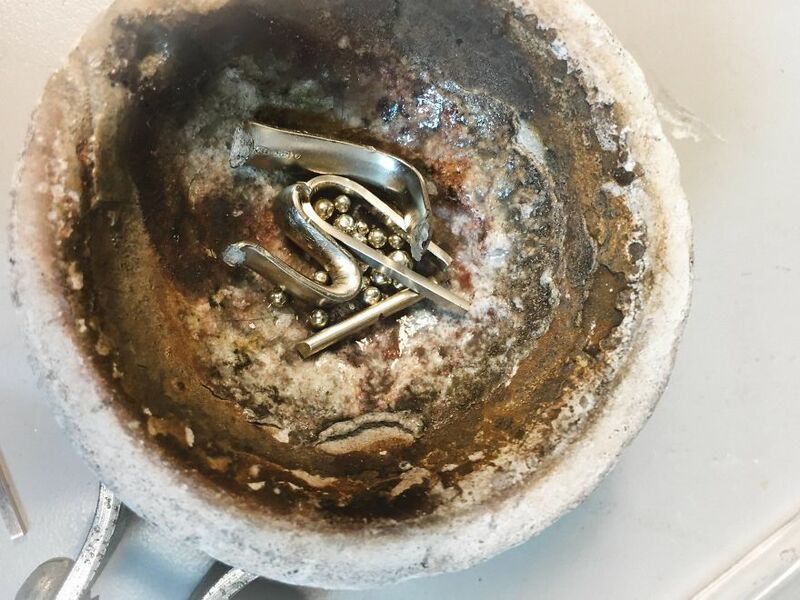 The first step in recreating a destroyed ring is to try to figure out the exact dimensions of the original. In this case, the destroyed ring had plenty of areas where I could measure the exact width and thickness of the ring. 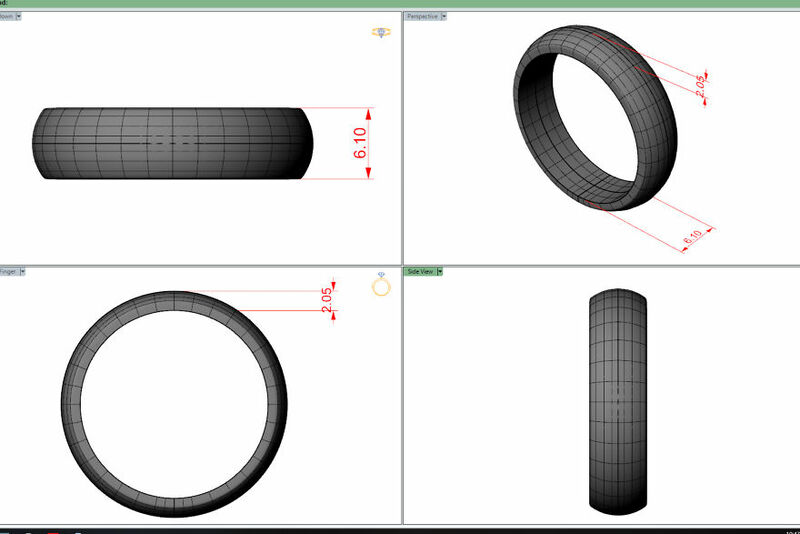 Once the measurements had been taken, the ring was redesigned. Typically this can be done with CAD or by carving a wax by hand. I prefer CAD due to the exactness you can achieve. 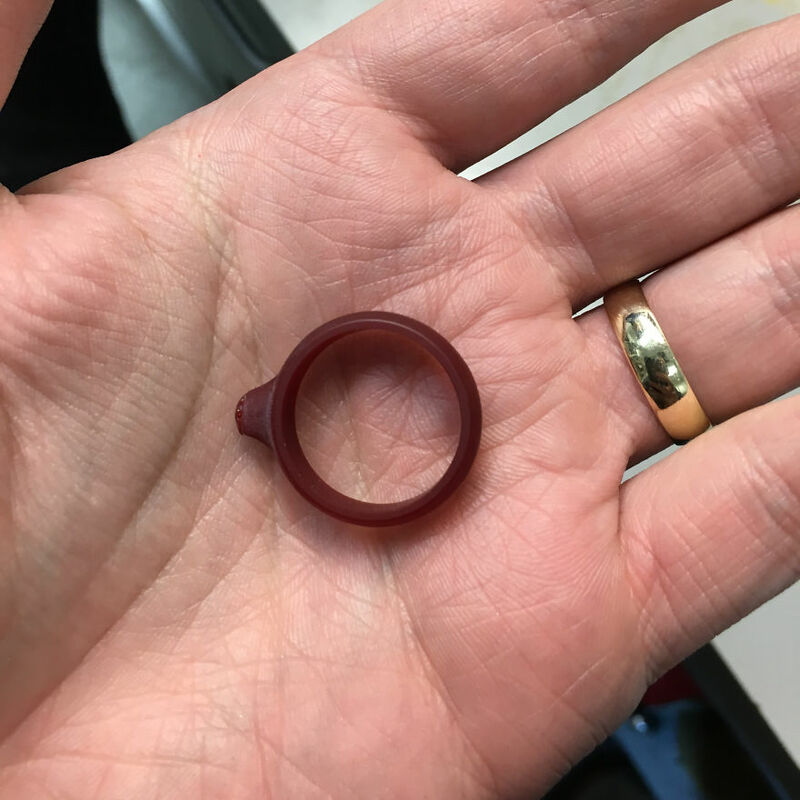 The wax ring model was 3-D printed in castable wax. These wax models can also be carved by hand with much success. 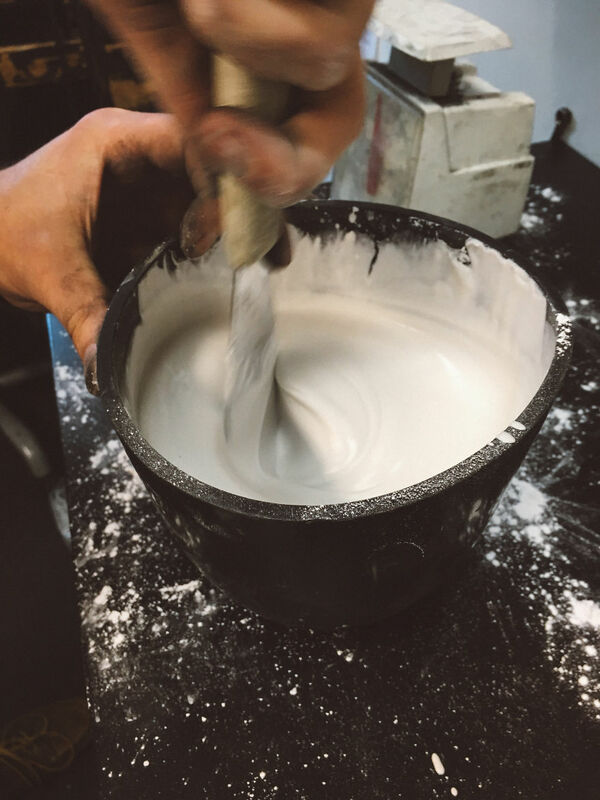 The wax model is attached to a base, or “sprued up” as is casting terminology. 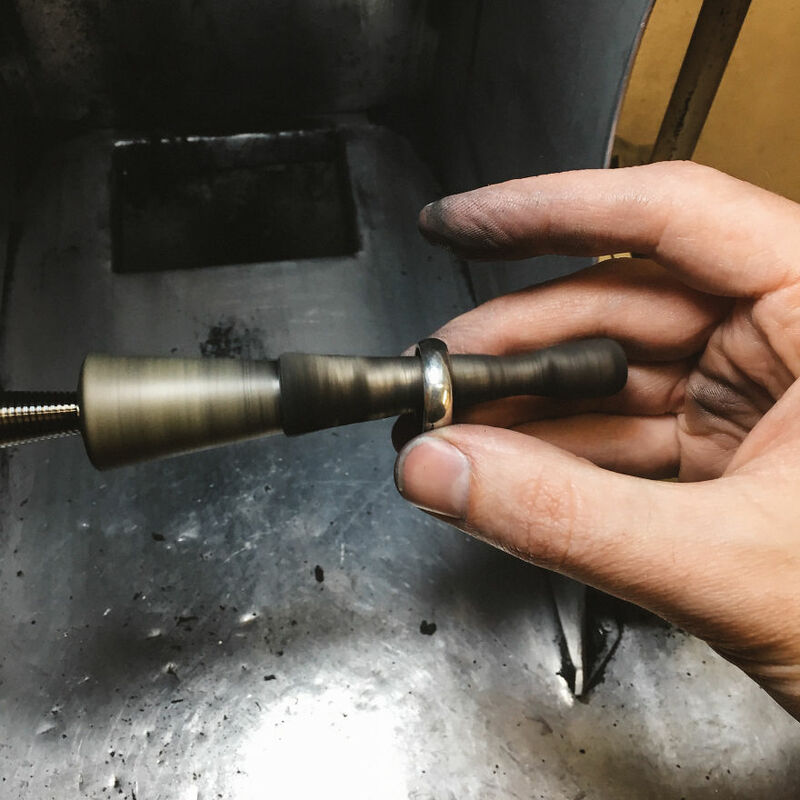 A wax pen is used to melt the wax and fuse the sprue and the ring model together. 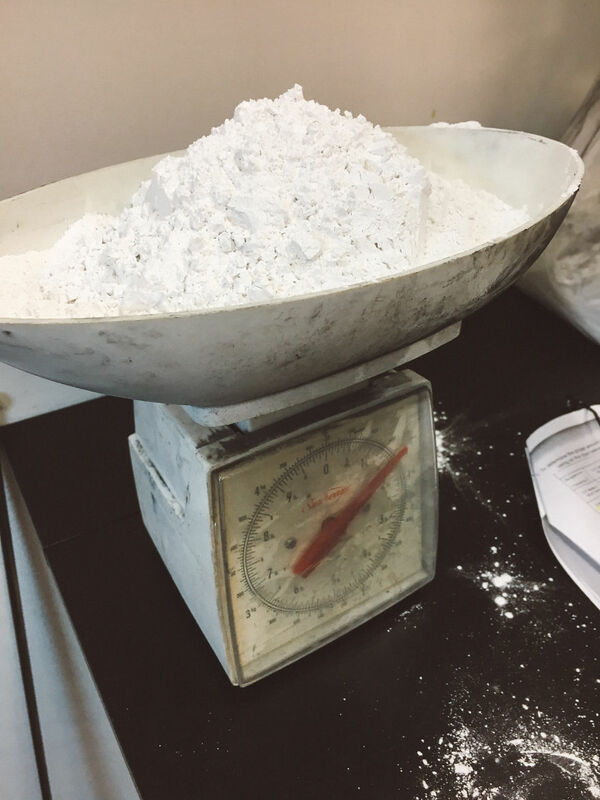 Investment powder is weighed on a scale This measurement will be used to fill the flask which holds the ring. Water is added to the investment and stirred in. I always think about pancakes during this step. Investment is poured into the flask. Within a few hours the investment has completely hardened. 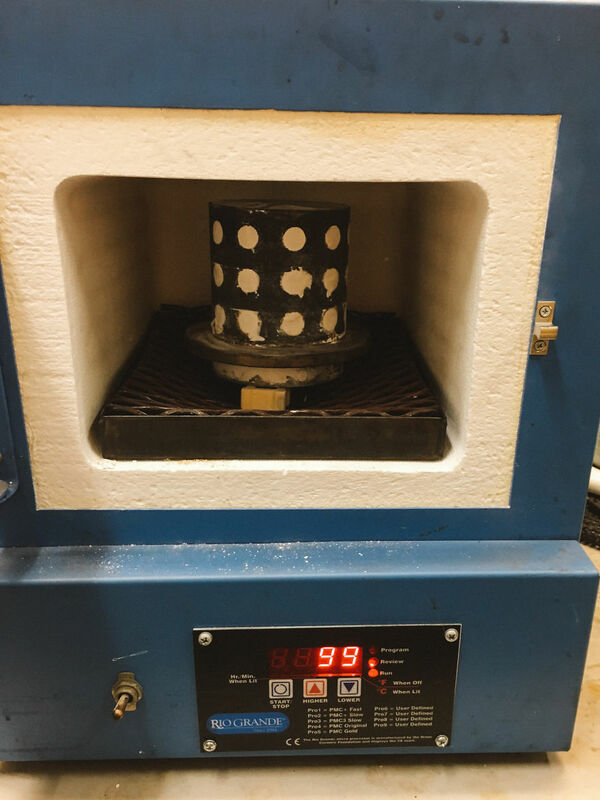 Once the investment has completely hardened, the rubber base is removed and the flask is put into the oven. What happens next is called the “burnout cycle.” During the burnout cycle the temperature inside the oven ramps up in increments. 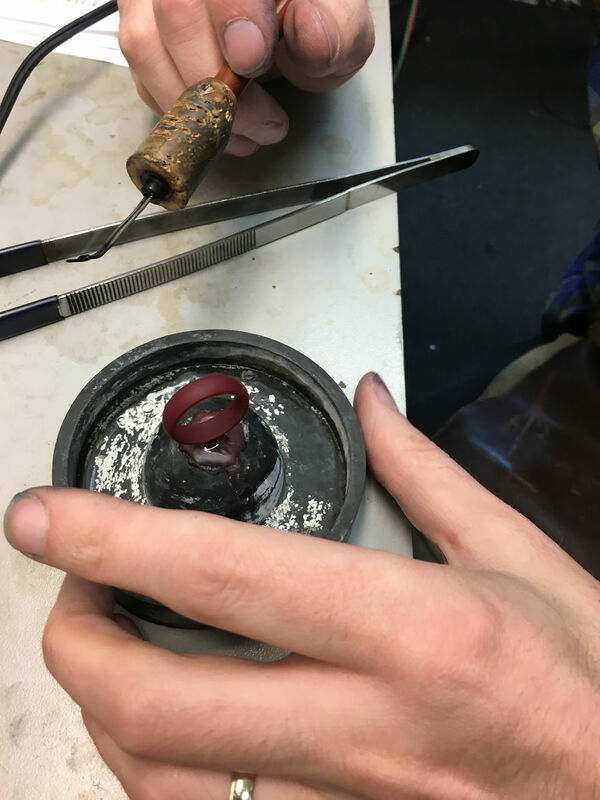 During this time the wax ring model completely melts and burns out of the flask. 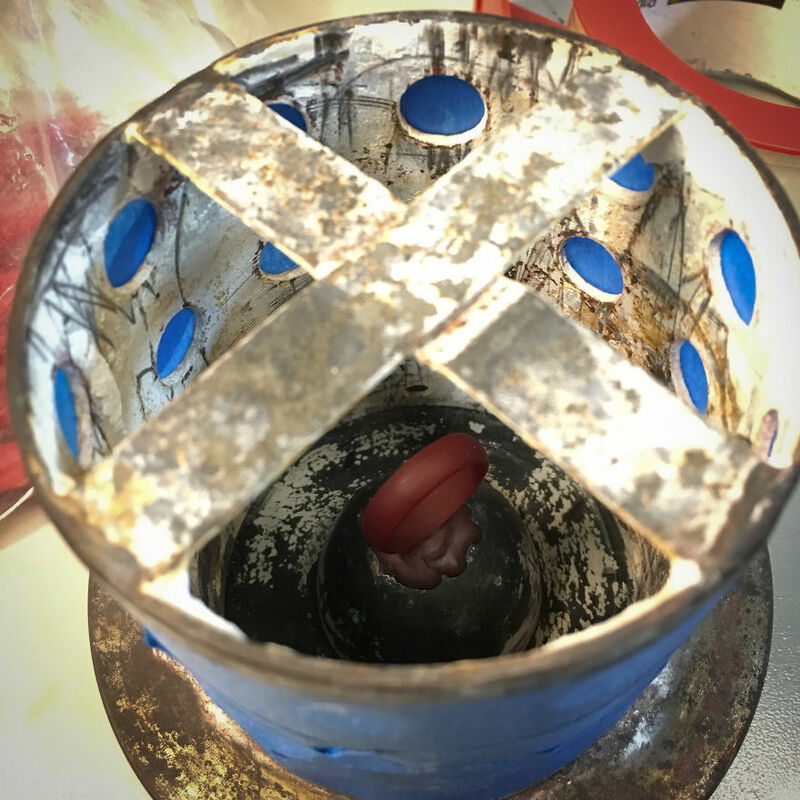 Any residual wax is emptied into the wax tray below the flask. 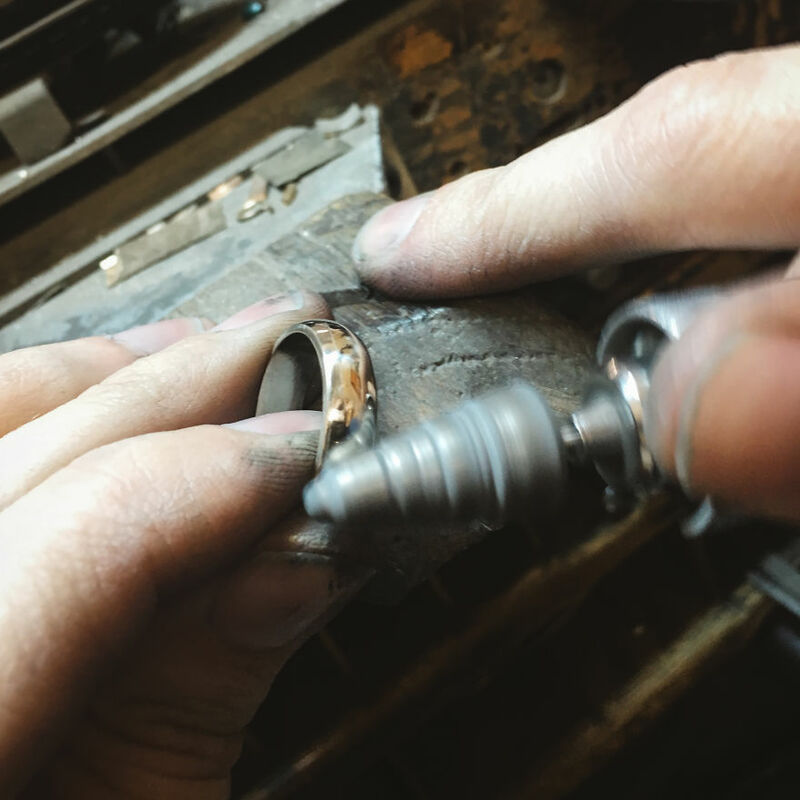 To ensure the new cast is clean and free of defect, “fresh” refined gold is added to the original destroyed ring. 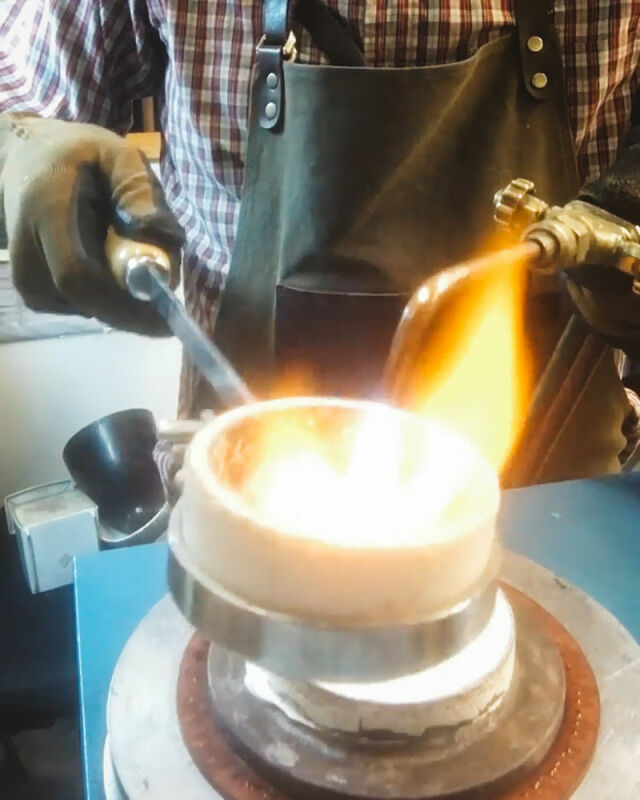 It’s always a good idea to add at least 50% refined gold when doing a new casting with existing metal. 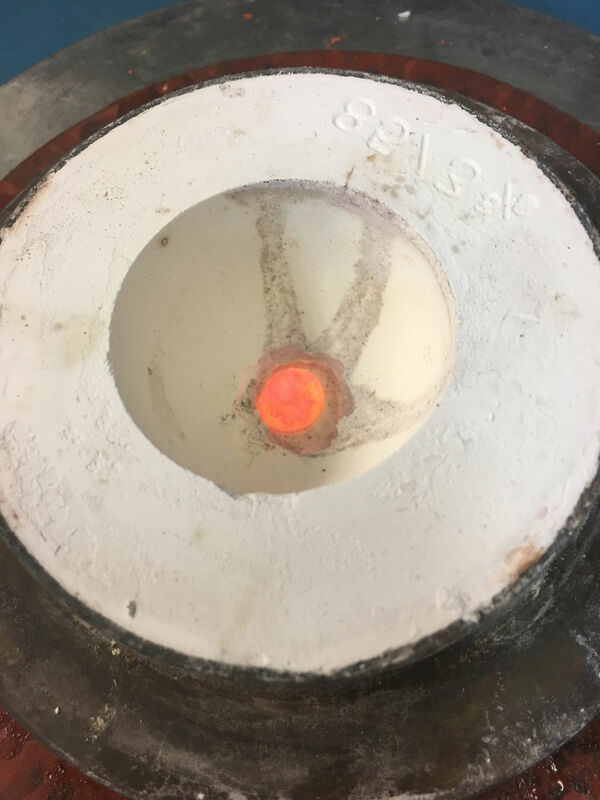 A hot flame is applied to the gold sitting in the crucible. Once the gold melts to liquid form, it is then poured into the flask! Remember the wax model that used to be in the flask? Well that was burned out, leaving a cavity in the investment for the gold to flow into! 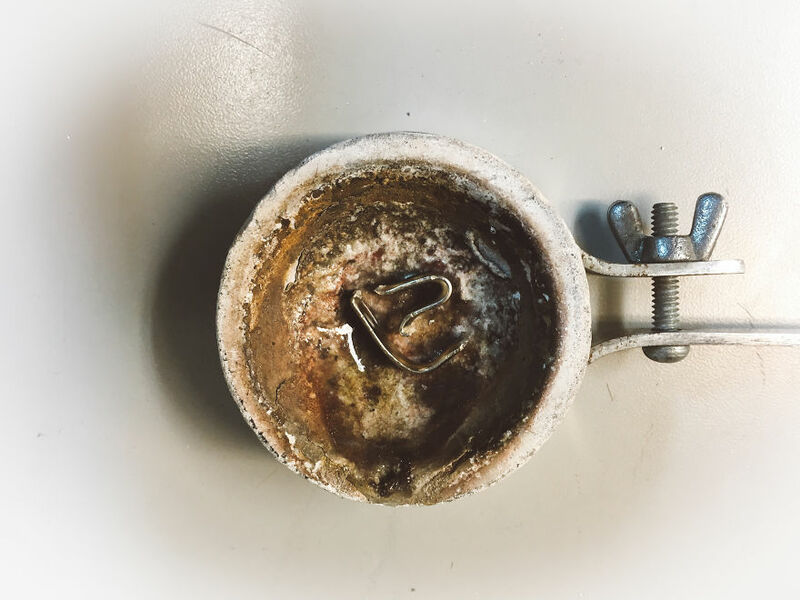 Molten gold is poured into the flask, perfectly fills the void and assumes the shape of the original wax ring model. A bit of excess gold is needed to fill the sprue portion. The rest forms a “button”. 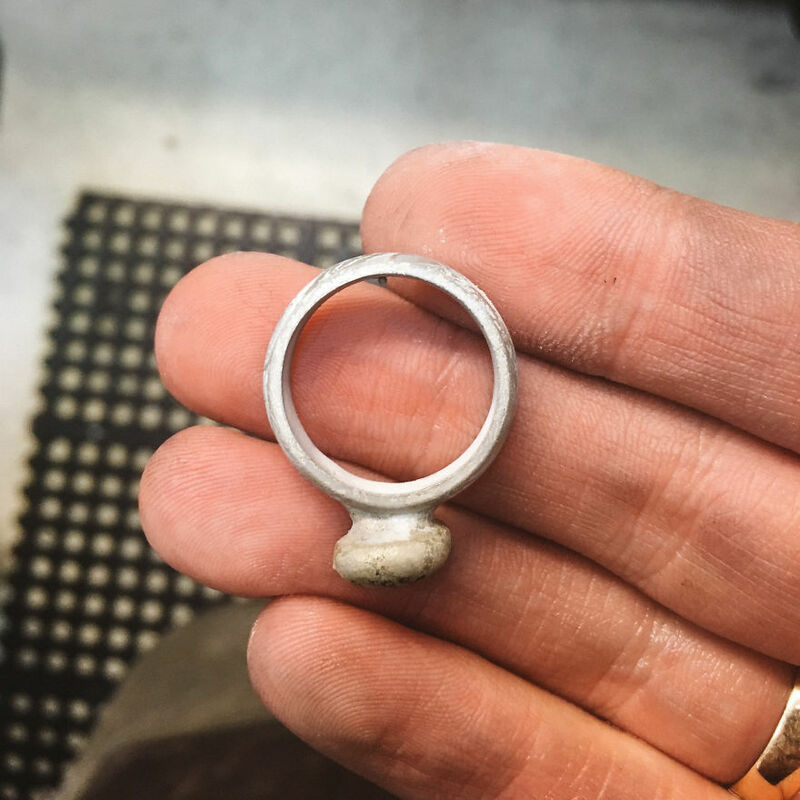 It’s always good to use a bit extra metal when casting to ensure the jewelry piece comes out as a complete cast. 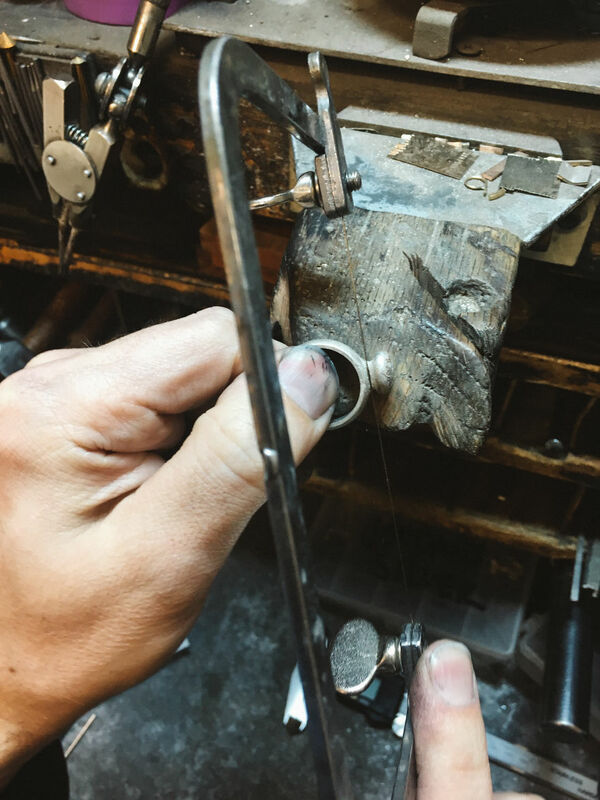 Using a jewelers saw, the “button” is removed from the raw cast. An inside ring grinder is used to achieve a smooth inside surface. 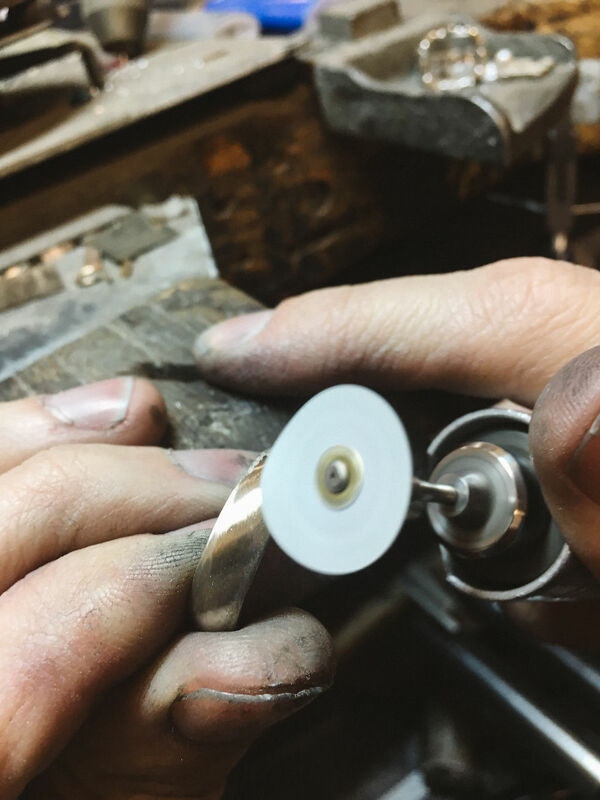 A fine sanding disc is used on the outside to smooth the gold and bring the casting out of it’s rough state. 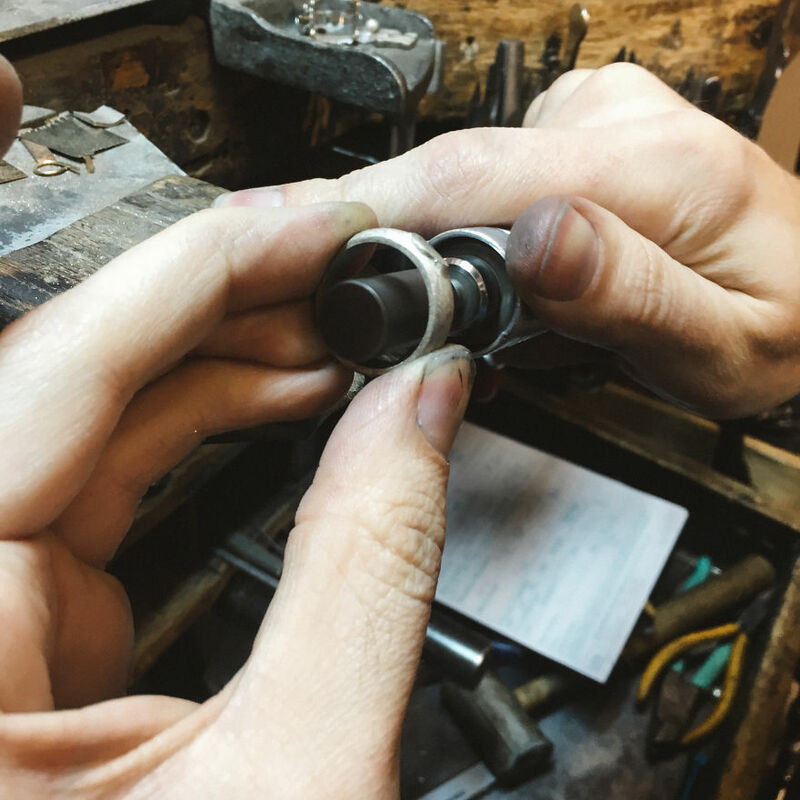 A hand tool is used to bring the ring to a semi-polish before it goes to the polishing machine. 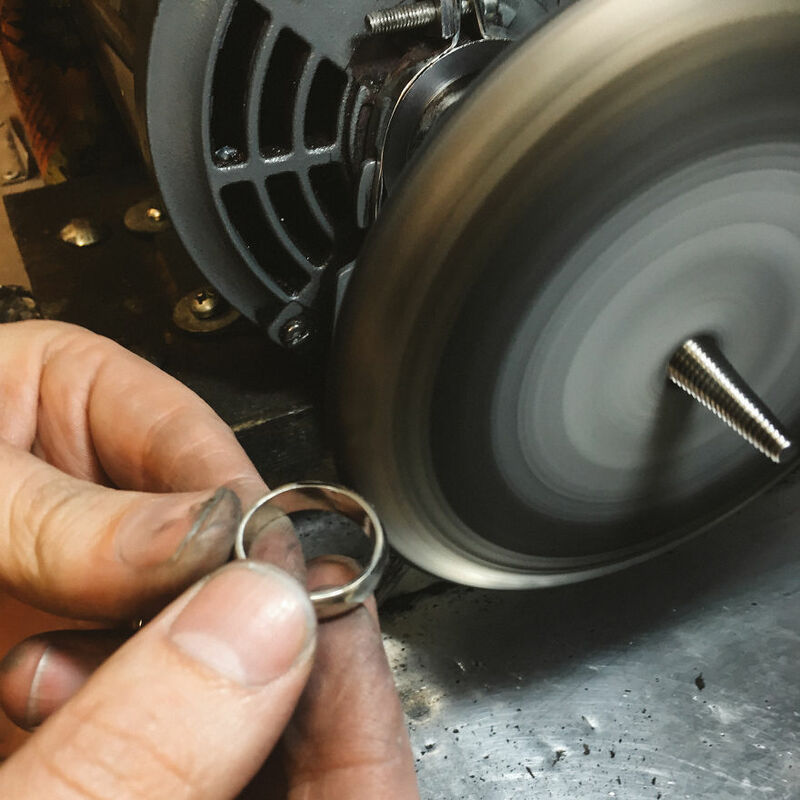 A lapidary is used to create nice crisp edges on the sides of the ring. 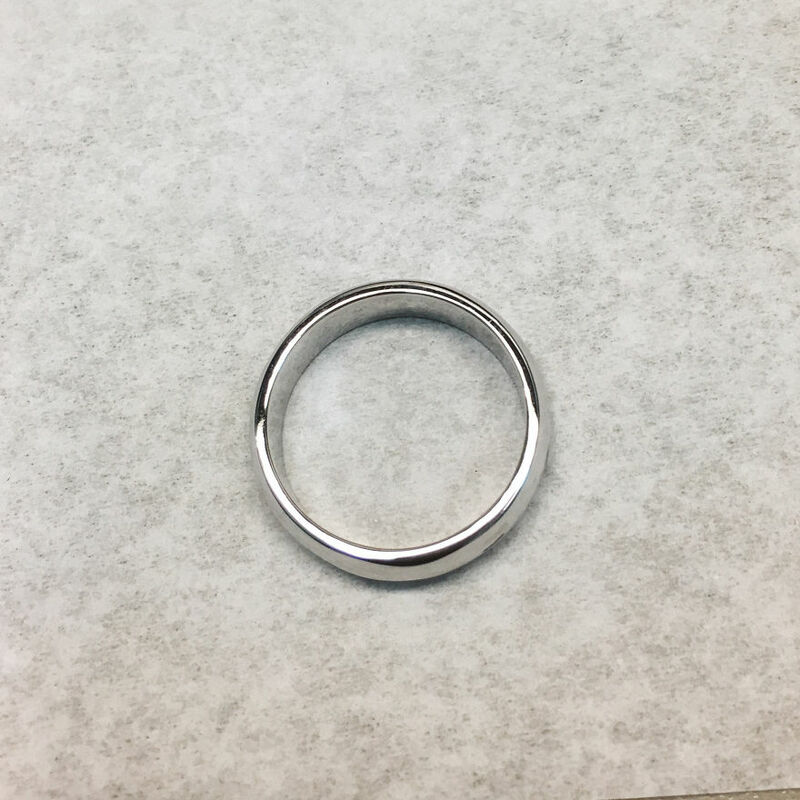 The inside ring finger creates a smooth and comfortable surface on the inside of the ring. 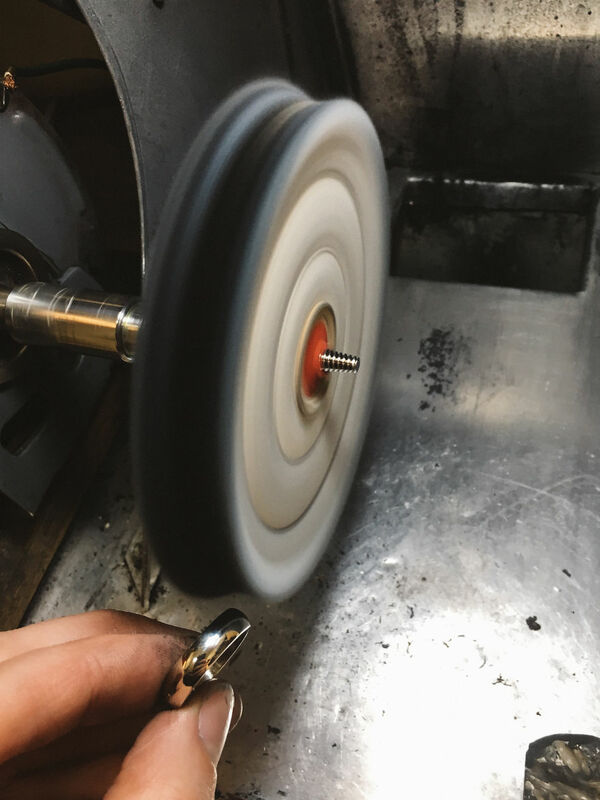 The final polishing wheel smooths out the entire piece and brings it to a high shine. In the end the man was super happy with the result and enjoyed showing his partner the brand new ring!